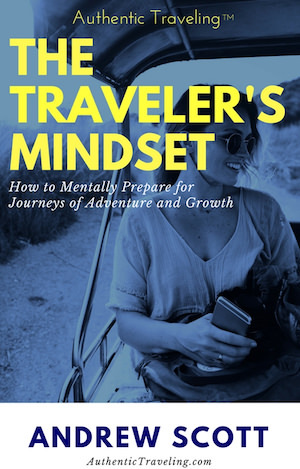 Most travelers to Italy visit Pompeii, the Roman Colosseum, and the nearby Forum. But the Italian peninsula is home to many other places where you can experience ancient history—some of which are just as impressive and much less crowded. Here are 5 archaeological sites in Italy you should explore. 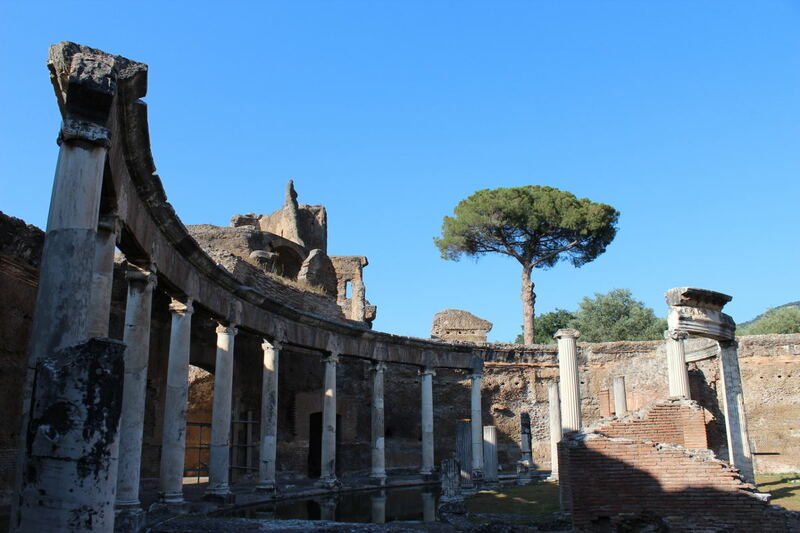 Just a 30 minute train ride from downtown Rome, Ostia Antica is a convenient and undeniably relaxing place to dig into the daily life of ancient Romans. The town is as well preserved as Pompeii, but with fewer tourists, and it works perfectly as a half-day escape from the bustle of Italy’s capital city. Baths of Neptune. Ostia Antica, Ostia. Ostia was founded in the fourth century BCE as a Roman military colony to guard the nearby mouth of the Tiber river from sea invasions. Later, it became Rome’s port, handling shipments of grain, oil, and wine from throughout the mediterranean. As the Empire grew, so did Ostia. By the second century AD, it was a thriving commercial center with apartment buildings, taverns, and even a fire station. Ostia was abandoned after the fall of Rome, and when the Tiber changed course, the area silted up. Layers of mud flowed in and buried the city’s buildings, in turn preserving them—at least until Baroque architects and art collectors began looting the area for marble and statuary. What remained was excavated by the Italian government beginning in the 1930s. Today, visitors encounter peaceful, cyprus-tree-shaded ruins filled with interesting details that help bring the ancient city to life. Walk around the Piazzale delle Corporazioni, a large rectangular space lined with partial columns that once served as the offices for local shipping companies. Look down and see the sidewalk mosaics used to advertise their speciality to a largely illiterate populace. Can you figure out what each one meant? 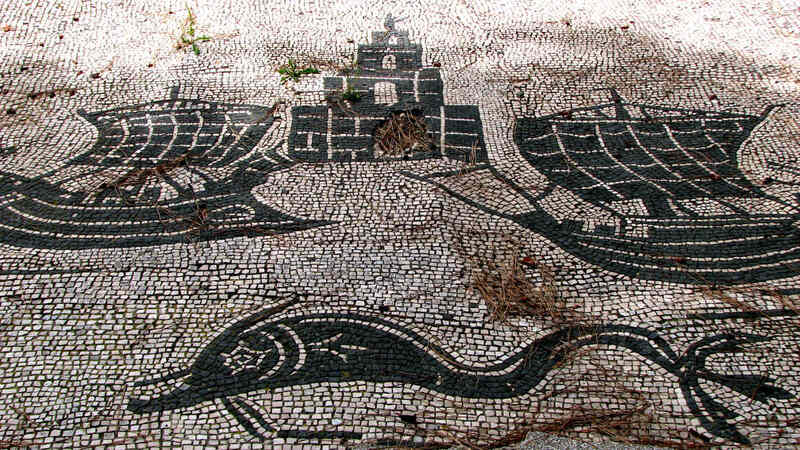 Detail of mosaic, Piazzale delle Corporazioni. Ostia Antica, Ostia. CC by 2.0--photo by Patrick Denker. Step up to the counter of the neighborhood tavern, where frescoes of food and drink—serving as a pictorial menu—still cover one wall. Then check out the insulae—multi-story apartment complexes—that once housed most of the city’s mercantile and lower-class populace. The ground floors were used for shops, with the living quarters upstairs. Note the marble-bench-lined rooms that served as communal toilets. 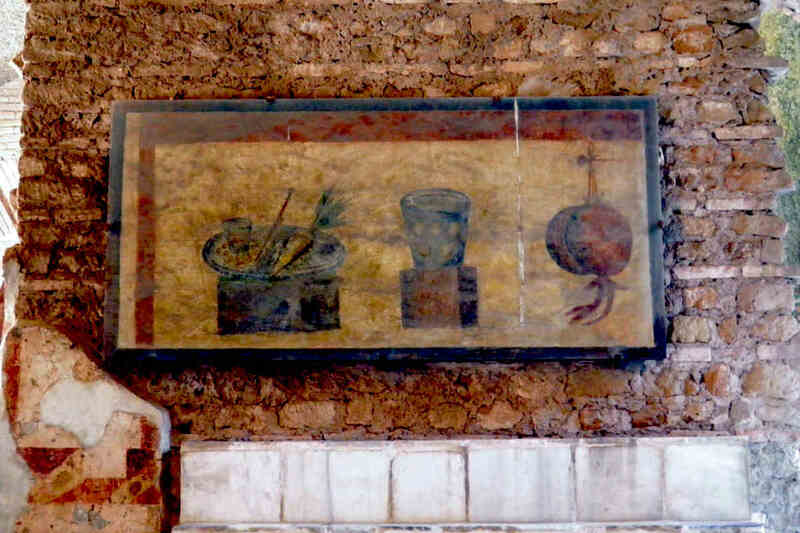 Pictorial menu from the House of the Bar, Ostia Antica, Ostia. CC by 2.0--by Carole Raddato. 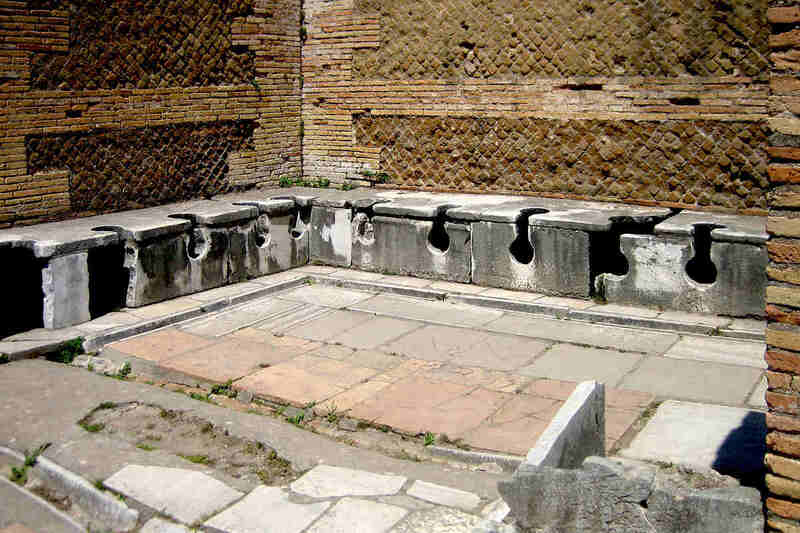 Public latrine in the Caseggiato dei Triclini. Ostia Antica, Ostia. CC by-SA 2.5--photo by AlMare. 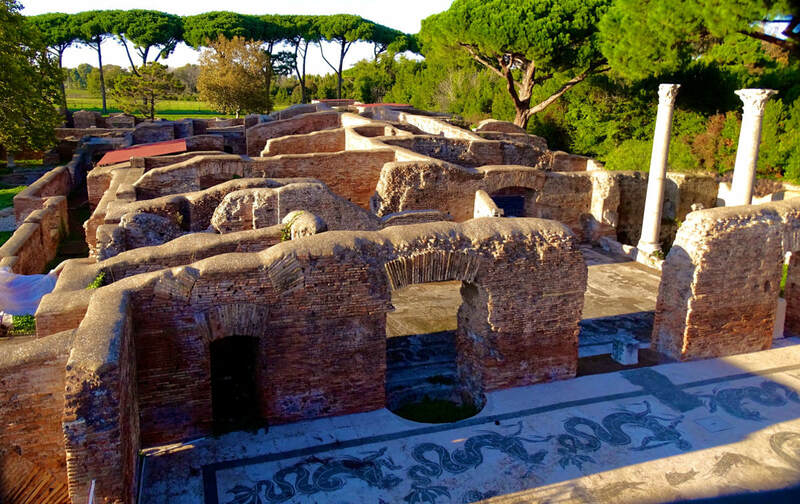 Give yourself time to explore Ostia Antica’s museum, which contains the portrait busts and statues that once adorned the homes of wealthy locals. The museum and archaeological site are open everyday, from 8:30 AM to sunset. A joint ticket covering both is €8. Check here for the latest hours and prices. Exploring the ruins of Hadrian’s massive villa, located in the countryside near Tivoli, is the perfect way to sample the grand lifestyle of the ancient Roman elite. It was built between 118 and 134 AD as a private summer retreat for the Emperor Hadrian. * The villa was one of the largest residences in antiquity, covering an area of 300 acres. It contains more than 30 structures, including temples, swimming pools, baths, and a theater. Hadrian designed much of it himself, taking inspiration from buildings he encountered on his many trips to Egypt and Greece. *Hadrian is also known for building a wall on the northern border of the Roman Empire (in present-day England), most likely to keep out foreign invaders. This barrier was the inspiration for the massive ice wall in George R. R. Martin’s A Song of Ice and Fire books and the corresponding HBO television series, Game of Thrones. View of statuary at the western end of the Canopus, Hadrian's Villa, Tivoli. After the decline of the Roman Empire, the villa fell into ruin. Excavations began in the 16th century, at which time art collectors removed almost all of the statuary, and much of the buildings’ marble was burnt to make lime for cement (an all-too-common practice then). Today, sculptures from Hadrian’s Villa can be found in collections throughout Europe, including at the nearby Vatican Museums. This pillaging badly damaged portions of the villa, so it’s worth studying the scale model at the entrance before exploring to get a sense of what it once looked like. Major points of interest within the ruins are labeled, and a few of the buildings have been partially reconstructed. 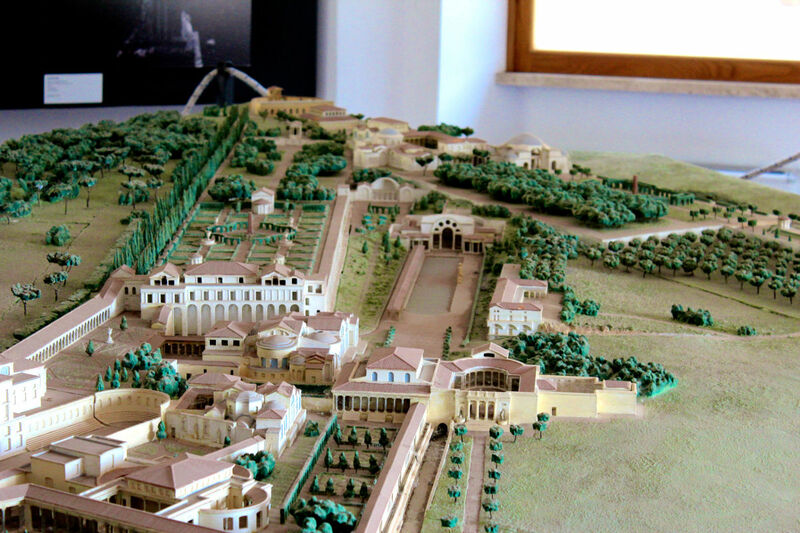 Miniature model of Hadrian's Villa. Hadrian's Villa, Tivoli. One such space is the Canopus, a rectangular pond designed to recall a canal by the same name in Egypt, a personal favorite of Hadrian. It was originally flanked on three sides by a colonnade, and decorated with Roman copies of famous ancient Greek statues and Egyptian originals. Today, modern replicas stand in their place. At one end are the remains of a monumental dining area. Near the entrance is the so-called Maritime Theater, a circular pool surrounded by columns, in the middle of which is an island. Despite the name, this was never used for theatrical performances. Rather, it was Hadrian’s private refuge, where he practiced painting and architecture. View of eastern end of the Canopus, complete with dining area. Hadrian's Villa, Tivoli. Maritime Theater, Hadrian's Villa, Tivoli. 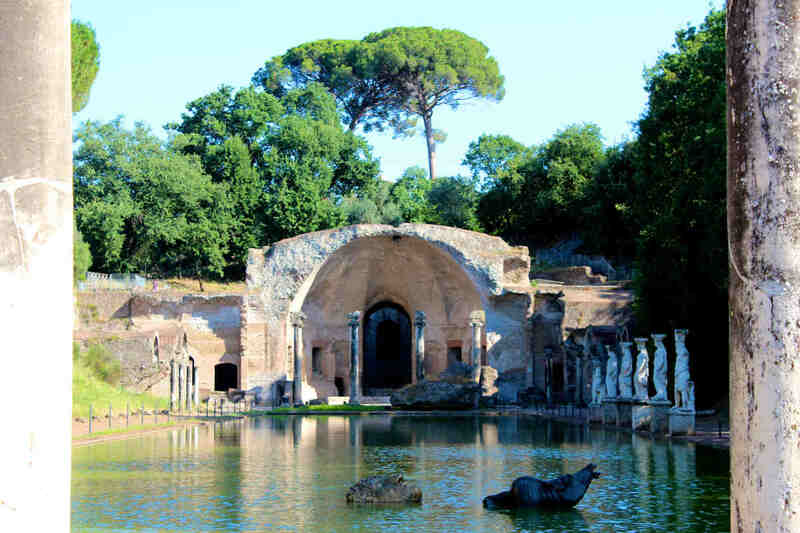 Hadrian’s Villa is accessible from Rome via a combination of train and bus or, more easily, by car. You will need several hours to explore it comfortably. Admission is €8 and the park is open everyday of the week, excluding holidays. Opening hours change with the seasons, so check here for the most up-to-date times. The Necropoli dei Monterozzi (Necropolis of Monterozzi) is one of Italy’s most important Etruscan sites. At first glance, it doesn’t look like much—just a hilltop of overgrown grass marked by cement huts—but once you venture into its frescoed rock cut tombs, you will understand its significance. Above ground at the Necropolis of Monterozzi, Tarquinia. This necropolis—meaning city of the dead—is home to over 140 painted tombs, of which 16 are open to the public. Scenes of banquets, hunting, and sexual acts provide visitors with a vivid picture of Etruscan daily life. They were frescoed by Greek artists in the style of their homeland, and are some of the only surviving examples of ancient Greek painting. The bulk of the tombs date to between the 6th and 4th centuries BCE. They are simple structures, consisting of one room—dug into the hill’s soft, volcanic rock—accessible via a narrow staircase, and topped by a mound of earth. These bumps gave the area an odd appearance, and is the basis for the Necropolis’ name—Monterozzi, meaning mountain of humps. Today, cement huts with tile roofs mark the entrance to each tomb. Read the sign outside, press the green button at the doorway to illuminate the frescoes, and watch your step as you hike down the stairs. The most impressive frescoes are found in the Tomba della Fustigazione, the Tomba delle Caccia e delle Pesca, and the Tomba dei Leopardi, the latter of which contains a lavish banquet scene. Interior view of the Tomba dei Leopardi, Necropolis of Monterozzi, Tarquinia. 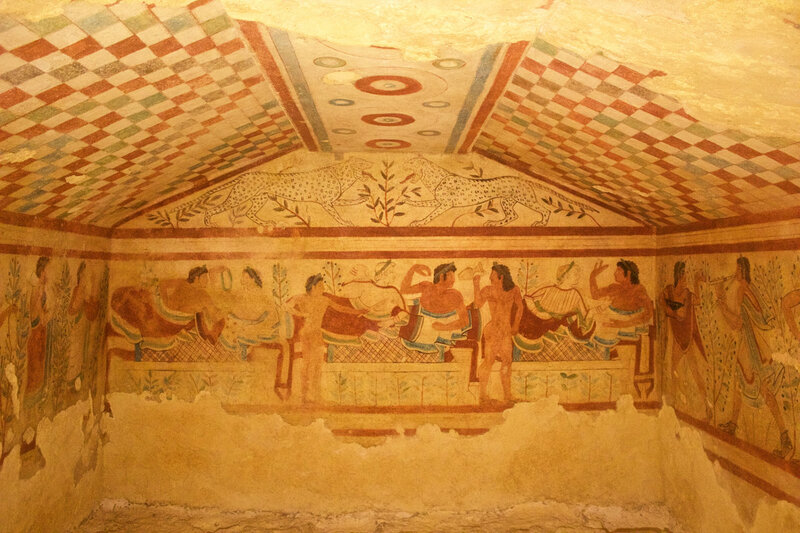 Exploring the painted tombs at Monterozzi is an incredible experience. As you venture below ground, you move back in time to an era when life and death was full of mystery. With only the occasional gust of wind to keep you company—despite its importance, there is a good change you will be the lone visitor—you can almost hear the Etruscans playing their flutes and singing their songs. Monterozzi is located just outside of Tarquinia, a hilltop community northwest of Rome that can be reached by train or car. From the city center, the necropolis is an easy 20 minute walk. A free shuttle bus is also offered near the tourist office (look for bus B). The site is open seven days a week, minus holidays, from 8:30 AM to dusk. Admission is €6. The city’s archaeological museum, which contains a number of locally-found Etruscan artifacts, is also worth visiting. Check here for more information. Complete with streets, squares, and neighborhoods, the Necropoli della Banditaccia (Necropolis of Banditaccia) is a veritable city of the dead—and also one the eeriest places you’ll ever visit. Thousands of tombs, both in the form of tumuli—circular mounds cut into the earth and covered with turf—and rock-cut trenches, fill this 12-acre, Etruscan site. 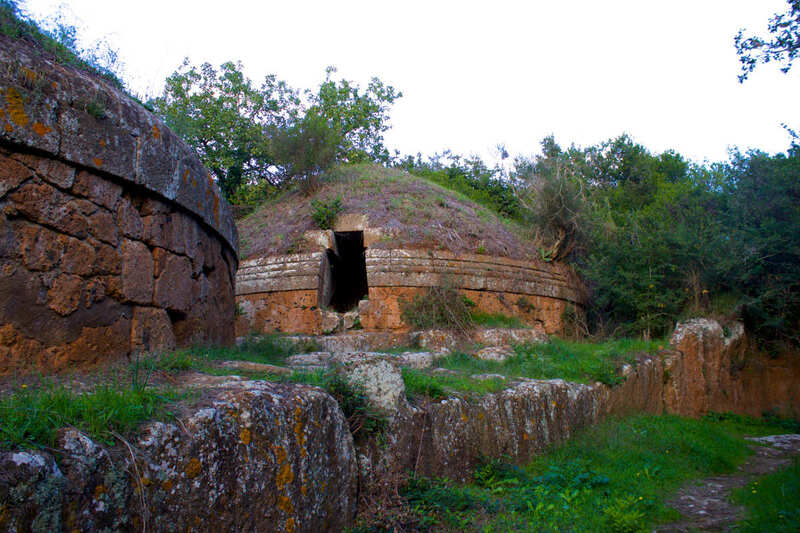 Tumuli at the Necropolis of Banditaccia, Cerveteri. Like at Monterozzi, most of the tombs here date to between the 6th and 4th centuries BCE. 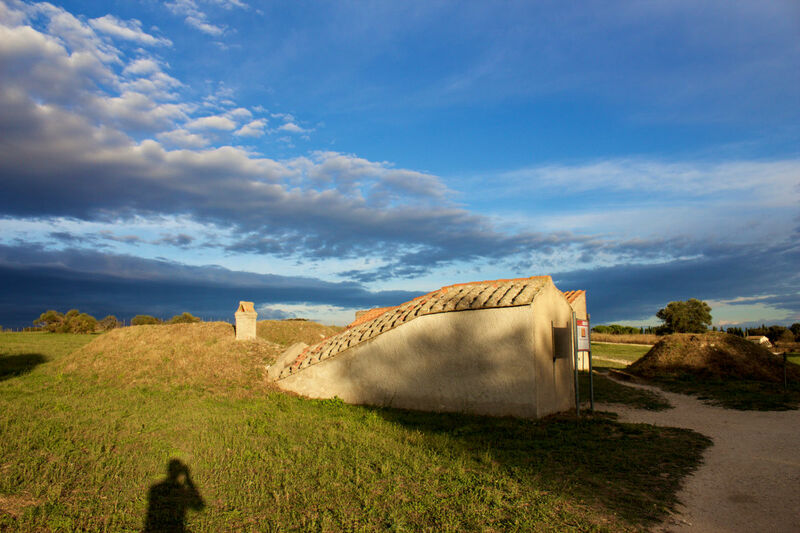 The tumuli were carved directly into the ground, recreating the plan and furnishings of contemporary Etruscan homes in stone. The Tomba dei Relievi is a particularly noteworthy example. 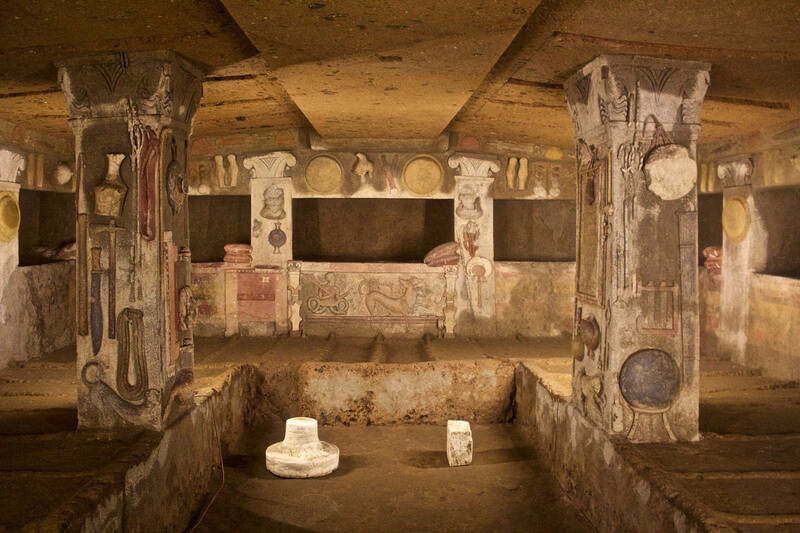 It consists of one main chamber, supported by a pair of columns and lined with 12 niches, within which deceased Etruscans once lay. The niches are modeled after beds, complete with carved pillows. Detailed stucco reliefs of household items and afterlife deities adorn the tombs walls, offering a colorful look at ancient domestic life. Tomba dei Relievi, Necropolis of Banditaccia, Cerverteri. Some of the tombs are outfitted with multimedia systems that project imagery onto the walls while playing an explanatory audio track, but those wanting to get the most out of their visit should first go to the Sala Mengarelli, where an introductory film is shown every 30 minutes past the hour. The Necropolis of Banditaccia is located on the edge of Ceverteri, about 50 kilometers northwest of Rome. It is best reached by car. Entrance to the site is €6 and it is open seven days a week (again, minus holidays), from 8:30 AM to dusk. Click here for more information. 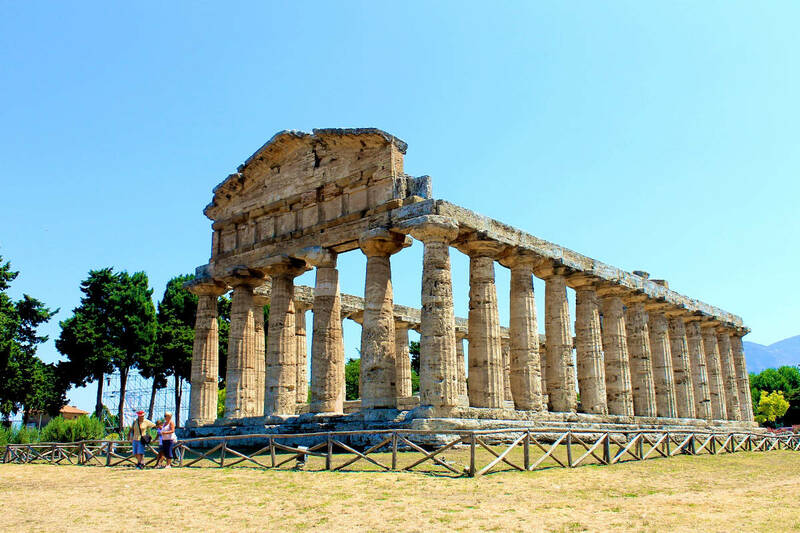 Far from the crowds that overrun better-known archaeological sites, Paestum is a fantastic place to relax and contemplate the beauty of ancient Greek architecture. It was originally founded by Greek colonists in the 6th century BCE, and soon became a vibrant town, complete with a series of monumental temples. Eventually the area was abandoned, and it turned into a malaria-infested swamp. It was rediscovered in the 18th century, and excavated in the 1950s. Today, Paestum’s three remaining temples are the best preserved in all of Magna Graecia, the area of Italy colonized by the Greeks. The Tempio di Cerere, which dates to around 500 BCE, was constructed to honor Athena, but Christians turned it into a church in the middle ages. The Tempio di Nettuno (left) and the Tempio di Hera (right), Paestum. The Tempio di Nettuno, dating to 450 BCE, is the largest and most intact, with only parts of the inside walls and roof missing. Nearby is the so-called basilica, which is actually a temple dedicated to the goddess Hera. This is Paestum’s oldest temple, having been built around 600 BCE. Note the strong curvature on the columns, which historians have theorized was done to emphasize the temple’s massive roof, as if the columns were buckling under the weight. Paestum’s museum contains finds from nearby archaeological sites. The undisputed highlight of the collection is the Tomba del Truffatore, or Tomb of the Diver. 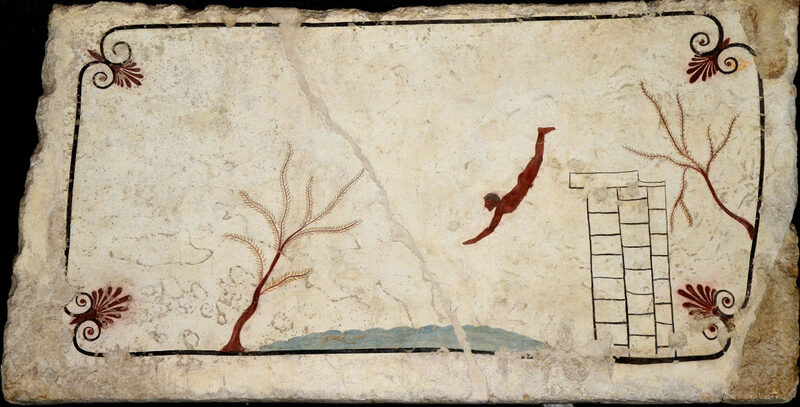 The name derives from a frescoed image on the tomb’s lid of a diver in mid air, which archaeologists believe represents the journey from life to death. Below this is a scene from a symposium, in which men recline on couches and drink from wine glasses. Frescoed image from the lid of the Tomb of the Diver. Museo archaeologico nazionale di Paestum, Paestum. CC by SA-2.0--photo by Carole Raddato. 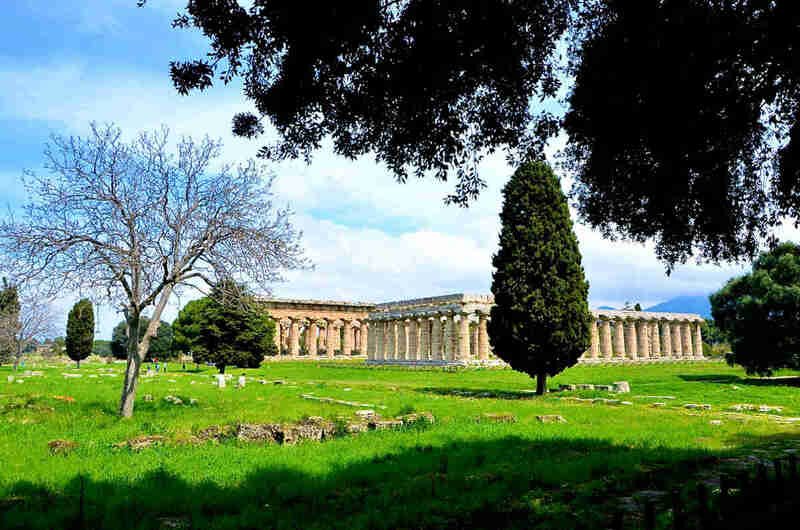 Paestum is 100 kilometers southeast of Naples, and is well connected by public transportation, with its eponymous train station located just a ten-minute walk from the site’s entrance. Admission to the museum and the archeological site is €7. Both are open daily, from 9 AM to 6:50 PM. Check here for the most up-to-date information. 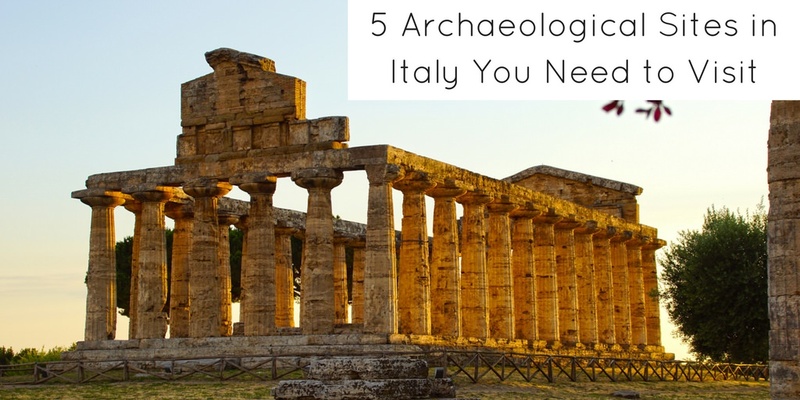 Have you been to any of these archaeological sites in Italy? What were your impressions? Share in the comments below! this is a great list! I don’t know if it because I am from New Orleans (with our cemetaries) or what but I would love to explore those 2 necropolis’. 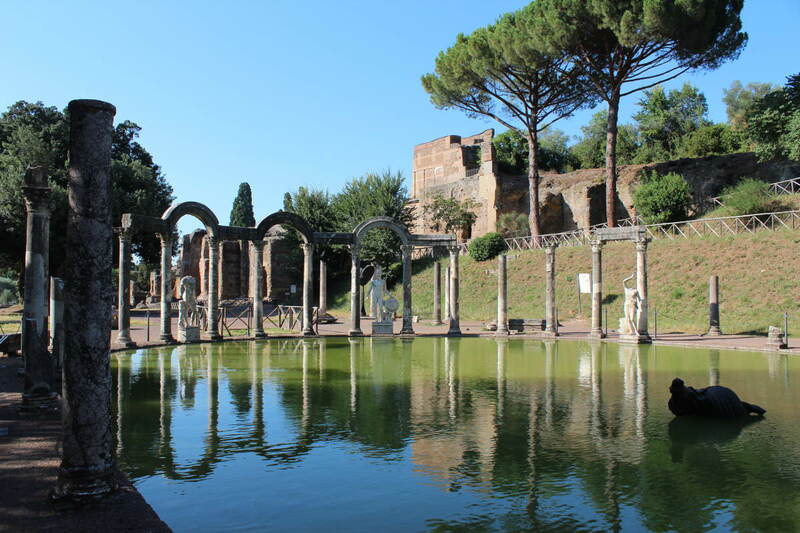 I find it always interesting way to learn about cultural beliefs and religion via their cemetaries…though Hadrian’s gardens looks amazing too. Thanks for the kind words, Eric! 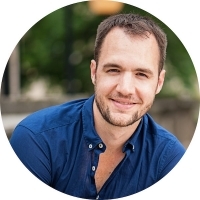 Yes, I agree with you–cemeteries can teach you a ton about a culture’s beliefs and values. Some of the most famous sites around the world, such as the pyramids at Giza, are really just elaborate burial grounds. I’ve yet to visit New Orleans, but when I do I’ll be certain to check out the cemeteries. Any specific recommendations? P.S., I hope that you and you’re friends/family are all OK after the incident last night!